The day is finally here, my friends. Today we are treated to the Franco and Art Baltazar-crafted "Crosswalk of Doom" story in Tiny Titans #44. As always, I read this issue before my youngest ran away with it, and I gotta be honest, I'm fighting the urge to sneak into her room and steal it back. This issue was fun, funny, and enjoyable. I laughed out loud more than once and loud enough that my dear wife, from upstairs, started asking my children what was wrong with me. "He's reading Tiny Titans," was my youngest's reply. "That's it?!" my wife asked, completely befuddled at the sheer entertainment this book provides. Go and get it my friends. Laugh a little and thank me later. My Greatest Adventure - in December! From a giant snake smashing through Zanzibar – and through Robotman – and an ancient reptile stalking the alleyways of Gotham City, to the endless plague of titans attracted to Tanga on a faraway planet, our heroes are put to the test as they face off against their demons! Robotman vs. a giant snake. . . hmmm. Not the most convincing and exciting comic plot I've seen solicited recently. At any rate, the issue comes out almost two weeks before Christmas, and six days before Hanukah, but that doesn't mean that you can't get yourself a little DP present for the holidays, does it? 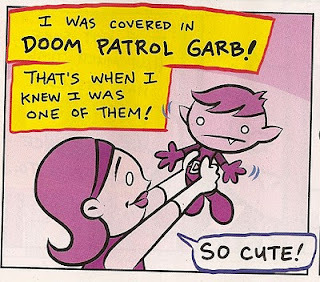 Also don't forget to grab the latest Tiny Titans this week for some Tiny Titan-ish Doom Patrol action.